For many years Harley-Davidson carbureted models were built with a V.O.E.S. These letters stand for Vacuum Operated Electric Switch. This Harley VOES switch has a very important function on a Harley-Davidson. It senses vacuum behind the butterfly of the carburetor and advances or retards the ignition timing accordingly. The Harley VOES switch remains closed until vacuum is introduced. When closed, the timing is retarded. Retarding the ignition is very important for start ups, or when the motorcycle is under a heavy load. When vacuum rises beyond a certain pressure, the switch opens and allows/”tells” the ignition to advance. When powering down the road, you will want a full advance for optimum performance. 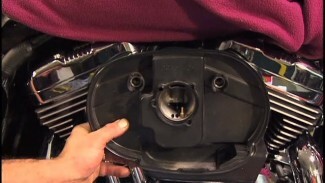 If your carbureted Harley has suddenly become hard to start or sluggish while riding, it may be an indication that your Harley VOES switch is failing, stuck open or stuck closed. In this video Bob walks us through the test procedure for a V.O.E.S. You will need a multimeter and a Mighty Vac. Start by isolating the switch from the motorcycle. This is relatively easy. It only requires that you to unplug the black ground wire, unplug a violet wire and unplug the vacume line from the switch. Hook up your meter to the switch. The black lead will go to the black Harley VOES ground wire and the meter’s red lead will go to the wire that was plugged into the ignition’s violet wire. Secure a completely sealed vacuum line between the the Mighty Vac and the switch. Set your meter to ohms with audible. You are ready to perform the test. Slowly squeeze the handle of the mighty vac. Record how many pounds of vacuum it takes to open the switch. Your meter will beep/ring when the switch opens. If your meter beeps before applying pressure, the switch is no good. It is stuck open. If your switch never opens with any amount of pressure, it is stuck closed. The switch is also no good if it opens earlier or later than the specific number (of vacuum pounds) specified in the factory service manual for your year and model. 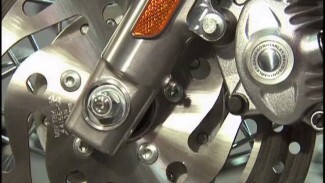 If your Harley has a VOES and has been giving you trouble starting, or been suddenly performing poorly. 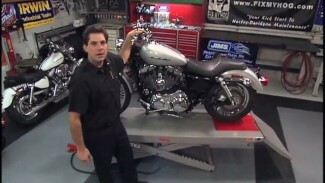 Take the time to test your Harley VOES. It is also a good idea to be proactive and test during a thorough service. If you find the need to replace your switch it is of utmost importance that you purchase the correct switch for your year and model.